Shelly is a guest teacher at Jules Mitchell’s Advanced 300 hr YTT. 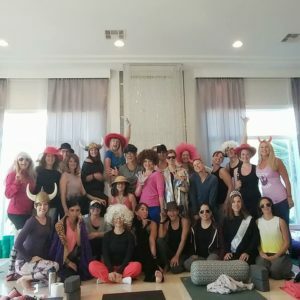 Shelly returns to Las Vegas in 2019 to teach yoga instructors evidence-informed content surrounding the function of the pelvic floor (PF) and biopsychosocial factors contributing to a healthy functioning PF and how and why this is relevant to yoga instructors. This inspiring, educational and empowering session includes both lecture and practice. We will integrate what the current evidence is suggesting about PF function with yoga practices and philosophy (movement, breathing, visualization, awareness, mindfulness/meditation) with a focus on cueing integration of PF within scope of practice of a yoga teacher in a class setting. Brief review of anatomy of the pelvis, including pelvic floor muscles (PFMs) and landmarks of the bony pelvis. Learn the numerous roles the pelvic diaphragm plays in overall health and wellness and why it is essential for all movement specialists to include knowledge and skills in addressing optimal pelvic floor function when working with clients and students. List the 4 categories of pelvic floor health dysfunctions. Discuss a variety of factors that contribute to overall pelvic floor health, using the yogic pancha maya kosha model and how this model parallels to modern healthcare’s biopsychosocial approach to rehab, health and wellness. Discuss the debate surrounding the performance of kegel exercises and cueing kegels for pelvic floor health and rehabilitation using a best evidence approach. Discuss Mula Bandha (MB) including the potential intention of MB from a historical perspective, and explore the various perspectives on cueing MB in yoga. Outline factors that may contribute to a Non-Relaxing Pelvic Floor and health issues that may arise from over-recruitment of pelvic floor musculature. Discuss one interpretation of a contemporary translation of the Chakra system, focusing on the first 2 chakras and how they relate to pelvic health. Briefly list the 8 limbed path of Raja yoga, and how addressing the limbs can contribute to a biopsychosocial-spiritual approach that enhances optimal and efficient breathing. Learn and experience how the respiratory and pelvic diaphragms work together as a coordinated team to contribute to overall health and wellness. Breathing methods, visualization and meditation techniques as they relate to pelvic floor health, particularly focusing on the importance of awareness and relaxation of PFMs. Awareness practices facilitating PFM excursion and control incorporating yoga practices and philosophy (coordinating breathing, awareness, movement, mindfulness). Evidence informed hip stability and extensibility activities that can optimize pelvic floor function with use of various movements, yoga asana and breathing.